The 122nd Infantry Battalion, also known as (aka) the Greek Battalion, was founded in January 1943 by an executive order of President Franklin D. Roosevelt. It was expected that the battalion would eventually deploy in Greece, which was occupied by Nazi German forces. The unit was named the 122nd Infantry Battalion to mark 122 years of Greek independence from Ottoman Turkish oppression. When I arrived late in the evening in Colorado Springs, eight miles north of Camp Carson, a jeep and driver was waiting for me at the train station, and I was driven to Headquarters Company of the 122nd Infantry Battalion. Excited and apprehensive, I checked in, and I sheepishly requested if I could be placed in the same group with my friend Perry Phillips. There was no need for my request; they assigned me to Company B, 122nd Infantry Battalion, the company Perry had joined the day before. Picking up my duffle bags I was escorted to B Company. Perry was the first to greet me in the barracks. He was as happy to see me as I was to see him. Our bunks were next to each other. Perry and I were the first Greek-American volunteers in company B. The rest of the enlisted men in the barracks were Greek nationals. The "Greeks" greeted us royally, they welcomed us as their younger brothers, a far cry from the group of soldiers I had encountered on the troop train. This was the first time the two groups, Greek nationals and Greek-Americans, would serve together in the American armed services. The nationals learned the English language from the Greek Americans, and the young Americans learned some choice Greek words, songs, rebetika dances, jokes. The Manghes of Piraeus, particularly, were excellent tutors. The native-born Greeks were in their late twenties and thirties, and the younger Greek-American sons of emigrant families from across the United States, though of different cultures, bonded quickly. The Greek Battalion was stationed at Camp Carson near Colorado Springs, Colorado, in the foothills of the Cheyenne Mountains. The terrain resembled many areas of Greece. President Roosevelt appointed Major Peter Clainos of Manchester, New Hampshire, commanding officer of the 122nd Infantry Battalion. He was the first Greek-born American to graduate from West Point. Born in Sparta, Greece, in 1907, he arrived in America with his father and one of his four sisters in 1912. Prior to attending West point, he was one of the two founders of the Greek-American fraternity, the Sons of Pericles, an AHEPA auxiliary. The officers of the 122nd were Americans, and Americans of Greek descent. The Greek-American officers, all volunteers, were recruited for obvious reasons. Since there was not a sufficient number of Greek-American officers who volunteered into the Greek Battalion, non-Greek-American officers were assigned to the Battalion. Many of these officers were qualified to join the Greek Battalion for absurd reasons. For instance, the army decided Lieutenant Robert F. Houlihan was eligible because he had studied classical Greek while a student at a prep school in Wisconsin. Lt. Houlihan was ultimately appointed commanding officer of Co. C 2671 Special Reconnaissance Battalion aka Greek Operational Group, or USOG. The initial group of men who arrived at Camp Carson were Greek immigrants. Most if not all of these men either arrived in America prior to WW2, or they were stranded in the United States as members of the Greek merchant marine when the Germans occupied Greece. These recruits were older than the average draftee and streetwise. A few of these men had fought against the Italians and Germans in Greece in 1940. Not having spent enough time in America, the large majority were not American citizens. Many were not volunteers; they had no choice and were assigned to the Greek Battalion. By no means is this to disparage the Greek national draftees' reluctance to volunteer in an infantry unit; a very small percentage of Greek-American officers and enlisted men volunteered to join the Greek Battalion. Infantrymen are the grunts of the army and in every war in every army a scant few men volunteer for infantry duty. 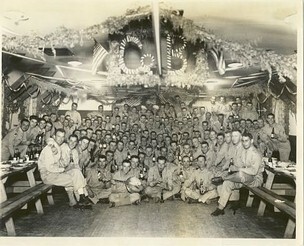 The Greek-American enlisted men, all volunteers, began arriving at Camp Carson in February 1943. Included among them was 22-year-old, 6-feet, 3-inch 1st Sergeant Theophanes Strimenos from Mobile, Alabama, by all accounts of the officers and enlisted men the catalyst of the Greek USOG. The Greek-American recruits were second-generation Americans, the children of immigrants. Though they were from different parts of America, their backgrounds were similar. In the East and Midwest, most of the men grew up in Greek neighborhoods. In other parts of America where Greeks did not cluster as such, their social lives centered among their Greek families and the Greek Orthodox Church. These men grew up as Greeks; most of them did not know a word of English when they entered kindergarten; as youngsters they proudly sang the Greek national anthem; some had trouble differentiating between the Greek and American flags, and their common enemy was the Turks. The commanding officer of B Company was Captain Milton; he had arrived with his family in the United States as a teenager from Greece. The officers I recall in B company were Lieutenant Nick Stathakos of Dallas,Texas,Lieutenant Frank Blanas of Milwaukee, Wisconsin and a 22-year-old Lieutenant Dada, a non Greek, who was very happy to have a couple of young Americans join him in the company. Later, another Greek American, Lieutenant Panagiotopoulos of Massachusetts, joined us from the 101st Airborne Division. There were two or three other officers whose names I do not recall. Co. B PARTY. Andrew and Alex 3rd and 4th from left. We did not receive the usual army basic training. The new recruits of the Greek Battalion were given a crash course under Lt. Stathakos. Basic training was in the morning and we joined our respective companies for further training in the afternoon. There were four recruits from the Bay Area: Perry, me, Jerry Petsas of Richmond in B Company, and George Andros from San Francisco in C company. The latter two would play an interesting albeit infamous part in the battalion's history. For the first three weeks of basic training we were not allowed to leave the camp. In fact we were told that our first leave would be given to us after the six-week period of basic training was concluded. Fortunately Greek Orthodox Easter fell late in April and we were given a two-day pass and ordered to return to Camp Carson for reveille Easter Sunday morning. An Easter celebration was planned at Camp Carson. Perry and I attended Good Friday services at the Greek Orthodox Church in Denver. How exciting and emotional it was for both of us. I recall closing my eyes and imagining myself back on Brush Street at my Assumption Church in Oakland while listening to the Lamentations on Good Friday. We attended "Anastasi," the Saturday night Resurrection service, and met many friendly and cordial Denver parishioners, and of course the beautiful Greek girls of the community. Throughout my military career the Greek Orthodox Church, in the respective cities and towns where I was stationed, was my home away from home. On our numerous trips to Denver, Perry, Alex, and four or five of our buddies would rent a hotel room in one of Denver's finest hotels. Two of us would check in and the rest of the group would join, separating the mattresses from the beds, sleeping on the floor, and whatever else was in the room. Our monthly pay was $31.00 and by pooling our money we had wonderful facilities. I recall staying at three four-star hotels: the Shirley Savoy, the Cosmopolitan, and the Brown Palace. Denver was a beautiful city, not unlike Oakland in the prewar days, and because it was 1500 miles from the Pacific Coast there was no brownout. It was a joy to walk the streets at night, with the neon lights and lampposts lit. Interesting how much one misses something we take for granted. We returned to Camp Carson on Easter Sunday, in time for reveille. It was a two-hour bus ride from Denver to Colorado Springs. Taking the last bus to Colorado Springs, we discovered a great way to travel on the many trips that we made from Denver; we would board the bus early, jump up on the baggage rack, spread out and catch some much needed sleep. You are here: PAHH.com : Memoirs : OSS : Part 1 : Page 3. Mousalimas, Andrew S., Part 1, Greek / American Operational Group Office of Strategic Services (OSS): Memoirs of World War 2 (PAHH.com, 2004), available at http://www.pahh.com/oss/pt1/p3.html.